I am sad to say that Geraldine has stopped her Movie Musings writing prompt. I didn’t help proceedings at all by not getting my stories in on time. Sorry about that, G.
Anyhoo, I had half-written this story but of course, missed the deadline. I thought I would finish it anyway. Ally was in the garden at midnight. The garden drew her at night now when she couldn’t sleep. Every night she was out there looking up at the sky, imagining entire worlds in the silhouettes of trees, straining her ears for the sound of a nightingale. You didn’t get nightingales in Ally’s part of the world but she listened for them anyway. Old Mrs. Jessop had told her once that when she was a girl she had heard the silver trill of the nightingale. A sound greater than joy, she had said. Ally thought it was possible Mrs. Jessop was delusional, but also that she was right. So she listened, but all she could hear was the wind cupping the leaves of the melaleuca in its hands then releasing them; the gentlest of handshakes. They were coming in the morning to cut down the bramble bush. The Council. The neighbours had complained that it grew too thickly along the road. Little Stevie from next door had cut his leg on the thorns. Winnie from across the road had thrown up after eating blackberries left too long on the huge canes that arched like swords raised in parade. Ally had promised Zac she would never cut it down. His mother had made blackberry jam from it, raspberry tarts, bramble puddings – for years. Don’t cut it down, he pleaded. Don’t ever cut it down. Ally had agreed, mentally rolling her eyes. The bramble bush made her think of fairytales. Sleeping Beauty asleep for a hundred years. Her castle lost behind brambles, waiting in her dreams for the handsome prince to come with his sword and cut them down. Ally’s brambles weren’t being cut down by a handsome prince. It was a man with a chainsaw. By the looks of the tangles out there he’d probably need a stick of dynamite or two as well. Or a bulldozer. Maybe a tank. She was worried about it. She hadn’t been able to sleep since she’d received the letter saying the brambles must go. She spent every night in the garden wondering what to do. She had offered to cut back the parts of the bush growing onto the road but there had been so many complaints the Council had said the whole lot had to go. The night sky was lilac grey. Why did people say the night sky was black? It never was. It was layer upon layer of greys and blues and purples, sometimes whites. You could see your hands under it, glimmering as if from the world of faerie. You could see the trees raising up their branches like supplicants, bound to the textured dark. She had promised Zac, but he was gone. Documenting war and misery in lands with hot, yellow skies. She heard from him in bits and pieces. It’s hard to get through, he said. His voice crackled as if his throat was full of sand. He had been gone for over a year. Ally feared she might not see him again. Whenever she turned on the news she held her breath, struggling to listen to stories of bombings and death, crossing her fingers that it wouldn’t be him. Dear God, please don’t let it be him. The bramble bush twisted, arthritic in the shadows. She could smell the raspberries split by small birds. She admonished herself for not making jams and treats that she could hand around the neighbourhood to keep the peace, but she hadn’t been able to touch a single berry. The bramble bush was a beacon. He would come back if she left it as it was. She knew it. Only he could tame its curving, thorny wildness. But if it was gone he might stay gone for good. Overnight Ally worked herself into a panic. She could convince the Council there was no need to cut all of the brambles down if she just made it neater, safer. At dawn she was chopping and sawing. But her shears and saws were inadequate, flimsy under the might of the brambles. After an hour she was exhausted, covered in juice and blood. With every slice and hack she imagined the ghost of Zac’s mother wailing, begging for mercy; but she persisted, for every slice and hack brought Ally closer to keeping the bush and ensuring Zac’s return. The man from the Council came at eight o’clock. He had a big truck and two assistants wearing heavy black boots so scuffed that the toes were white. Ally begged them not to start work. Look, I’ve been trimming it back, it’s much better now, she said. I’ll keep it in check, I promise. Please don’t cut it down. The man from the Council looked at her. My old gran used to make bramble jam, he said. We’d eat jars of it in one sitting it was so good, on thick, white slices of toast. Ally felt her heart soar, but the man shook his head. I’m sorry. I got me orders, love, he said. You’d better go inside, this is going to make a bit of a mess. Ally sat below the kitchen window and wept as the chainsaws sang. She heard them cracking and tearing the brambles. The smell of dust and wood and crushed fruit rose. She imagined the ghost of Zac’s mother, pounding at her chest in anguish, deciding to leave this world for good. When it was over the man from the Council came. Handed her a clipboard. Sign here, he said. Ally’s hands were still bleeding from the thorns. She could barely hold the pen. When the man from the Council left she steeled herself to go out into the garden. It looked better, bigger. Bare. Already Ally could see where she could put some flower beds. Maybe a bird bath. She chided herself for seeing the positives in what was really a negative. The bramble bush was gone. Zac probably was too. The symbol of his return had been destroyed. That night on the news there were reports of journalists being caught in an explosion. Authorities were unable to identify the bodies. For an entire month Ally called, faxed and emailed; trying to ascertain if Zac was alive or dead. Nobody knew. She stood in the garden every night, looking at the place the bramble bush had been. The ground was violet, obscuring the past. Ally wondered how it would feel to live the rest of her life alone. In the morning Ally couldn’t get up. She was tired of standing night after night in the garden, clinging to something that was no longer there. A car pulled up, idled for a long time before driving off. Someone knocked at the door. Ally hoped that whoever was standing there would go away. She was warm under the covers. Ally. The voice was soft. Ally knew that voice. It was as familiar as her own skin. She threw open the door. It was Zac. Zac. It was all she could say. Zac. She was memorising every detail. His dusty clothes. The shadows under his eyes. The bandage on his head. Holding him, touching him was better than anything. Anything. No poet in the history of poetry could describe it. It was better than anything. I thought you would never come back, Ally said. They cut the bramble bush down and I thought it meant you were gone for good. I was always going to come back, Zac said. They walked out to the garden. The place where the bramble bush had been was full of birds scratching for seeds. The sky threw bolts of gold on the grass. Let’s plant some flowers, Zac said, holding Ally close. *Image with thanks from Ryde Cemetery. Perils of an Online World. Lovely story, Selma. Like Lissa, I’m glad Zac came back even though the brambles had been cut down. Sad and sweet. I also cling to the past and have a difficult time taking out plants that my mother planted when I was a little girl. I plowed through to the end because I was WORRIED about Zac. You have that talent, you know. Great job! What a powerful, moving tale Sel. You’ve done my final MMM prompt and yourself, proud! PS: Im going to post a link to your story with this final prompt over at MPP. That way it can still be shared. I thought her had died, how exciting to find he didn’t. I always get so caught up in your stories! How sad Geraldine has ended her MMM. I feel guilty for not participating more. I had to make him turn up. It was too heart-wrenching if he didn’t. I thought about it, but it just seemed cruel. Glad you liked it! I am the same. You’ve probably heard my story of the magnolia tree in our old house that was cut down by the new owners and my dismay over it. They also threw out my study door – which was an antique door and had a vintage glass doorknob. I couldn’t fit the door in my car but I did steal the doorknob. Bastards! What a fantastic comment. I am so pleased you wanted to know if he was all right. That has made my day! I am really happy you liked it, G. And once again, I am sorry things didn’t work out with your prompts. Maybe we could think about doing a site together in the future. Might be fun! I learned in my horticulture course about blackberry bushes and how untameable they can be. What a pity because I love a nice blackberry jam. A beautiful tale and even better as there was a happy ending. I think a shared prompt blog would be great! Let me know if/when you want to chat about this. Thanks Cricket for your kind words too. I was sad to see MMM bite the dust but what can ya do? I love participating over at OSI (on Sundays)for now. Sel, Id still love to see your take on some of the prompts there. Next Sunday’s prompt is : talisman, now that’s one that I KNOW you could knock our socks off with! Not to be pushy but I love reading your work and oftentimes I see an OSI prompt and imagine you writing for it, I really do! 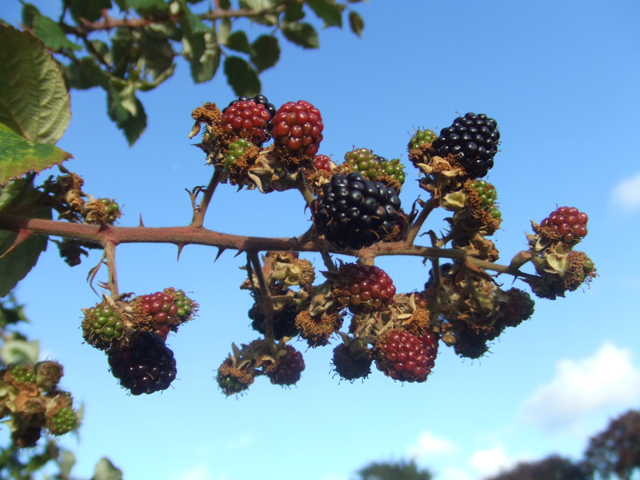 When I lived in Scotland we had a lot of brambles on the way to school. They are so tough. Almost like iron. I don’t know how your standard gardener would be able to stop them from getting unruly. But the berries are so good. Amazing that such a tough old plant can produce such gorgeous fruit! A shared prompt blog is definitely something to think about. We should stew over it for a while. I might visit OSI. For some reason I just thought it was to do with poetry but if they’ll take stories then that suits me down to the ground! Thanks for your kind words. You are such a sweetie, G! You know, I didn’t think of it like that. She didn’t do the deed herself, did she? Thanks so much for pointing that out. The things I miss! I am sorry we ended ours. But I think we’re both a bit strapped for time at the moment. Maybe in the future things will ease up a bit! And OSI is all about all kinds of writing. I’d love you to join us there. And yes, a shared blog, I’m thinking on this too. Take care Sel, healing thoughts to you….